Members of the public packed Thursday's OPSB meeting as Superintendent Henderson Lewis presented his recommendations on school closures. Members of the public packed Thursday’s OPSB meeting as Superintendent Henderson Lewis presented his recommendations on school closures. 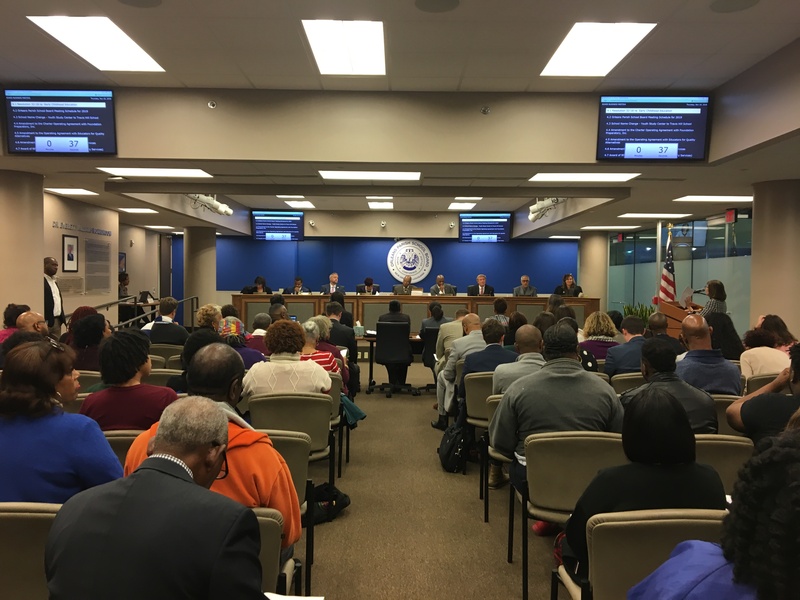 Thursday’s Orleans Parish School Board meeting devolved into shouting at times, as frustrated citizens struggled to conform to the district’s public comment policy following school closure and relocation announcements. Orleans schools Superintendent Henderson Lewis Jr.’s biggest news included five school closure recommendations, a few school relocations and several charter approvals. Lewis’ recommendations — presented as a report — take effect unless the board overrides them with a two-thirds vote. If the board does not formally move for a vote on them, however, they are not considered “action items.” And the public is not entitled to comment on them. Lona Hankins, a parent and former district employee, implored the board to hold its committee meetings — where board members discuss most of their policy decisions — at times and in places that are accessible to the public. They are often held early on Tuesday afternoons at the district’s Algiers headquarters. Hankins managed to get her comment in on an action item regarding the board’s 2019 meeting schedule. “The community is begging to get involved and this room is unsuitable,” she said of the boardroom. Not too much of Lewis’ report on Thursday was a surprise. The meat of his presentation had been delivered at Tuesday’s committee meetings just days after state ratings were announced. He acknowledged the weight of his decisions to the packed boardroom that got increasingly warmer as the meeting went on. Five schools — Cypress Academy, Edgar P. Harney Spirit of Excellence Academy, McDonogh 32 Elementary School, Medard Nelson Charter School and William Fischer Elementary School — will close at the end of the school year. Lewis said the closures were difficult decisions. He said it was hard on him personally too. Lewis said Nelson, Fischer and McDonogh 32 will not be taken over by a new operator because there are seats for students in higher-performing schools near those campuses. Lewis wants to revoke Harney’s charter for non-compliance in several areas. If that happens the district will directly run the school. Harney responded by hiring another lawyer. The three schools had been rated F’s for years. Letter grades matter most the year charters are up for renewal. Later in the meetings, Hankins criticized the practice of allowing charters to have F scores for years before closing them. Technically, the district is not renewing their charter contracts. There was news for Cypress Academy parents and Nelson school neighbors. Cypress students are being automatically enrolled at Foundation Preparatory Academy, currently located about a mile from Cypress’ Orleans Avenue building on Esplanade Avenue. Lewis announced Foundation Prep will move to Nelson school on St. Bernard Avenue next school year. Cypress’ board abruptly decided to close the school days before the end of the school year in May. The district initially vowed to directly run it for two years. But district officials went back on that promise this month, instead opting to close the school. “Unfortunately the outlook of Cypress is now more dire than it was in May and I can no longer direct-run that site,” Lewis said of the breached two-year commitment. Lewis also announced IDEA Public Schools would get the Gaudet school building in eastern New Orleans. The national charter group is new to New Orleans and had a charter approved last year. It will open a school at Gaudet for the 2019-2020 school year. Perhaps Lewis’ most contentious update was about McDonogh 35 Senior High School. The room was packed with “Roneagles,” the school’s mascot. The district is phasing out the historic high school. It failed to secure a non-charter “contract” operator for the school last spring. On Thursday, Lewis said the district will release a request for a “school management agreement” for current grades at McDonogh 35. “We are also extremely close to choosing a new ninth grade academy operator for McDonogh 35,” Lewis said regarding the second part of the district’s plan for the high school — restarting it with a class of ninth graders, then phasing in 10th through 12th grade by adding one each year. He said he would bring a recommendation to the board in December. Later in the meeting, Medard Nelson Elementary School parent Alex Lafargue stood up. “What about my [public comment] card for Nelson Elementary?” he said, standing up from the back row. “What action item was that?” board president John Brown Sr. asked. The meeting continued. Lafargue remained standing in silence. Lewis noted he is working to expand A-rated schools. He also approved several charter applications and denied one. After Lewis’ presentation, the board approved several routine items, including a few contracts, two charter amendments and a cooperative endeavor agreement with the New Orleans Police Department to use an abandoned school to train police for active shooter response. The board also approved a resolution allowing its lawyer to seek legal action against Crescent Leadership Academy after its abrupt closure on Oct. 31. Because these were action items, the public was finally allowed to speak, and the meeting became heated at times. However, when speakers veered off topic — to school closures, for example — they were asked to leave the podium. At another moment, organizer Ashana Bigard spoke from the audience. A collective “no” was the response. Several speakers and people in the audience called for the district to directly run its schools. After the meeting, Bigard said she planned to help parents organize. She said she was particularly concerned with the trauma students experience when they’re moved from school to school. Asked after the meeting about the board’s public comment policy, board member Nolan Marshall Jr. said he thought parent meetings were a better way to have in-depth conversations with the community. Asked about parents reaching board members, he said maybe board members should attend school closure meetings. The Lens has witnessed board members attend those in the past. At the last two meetings we attended, the school’s district board member was not there. Part three in a series on school closures in New Orleans. The centralized school enrollment lottery takes months to conduct and offers special priority to students in closing schools. Two parents whose kids attend closing schools tell us how they’re playing the odds for next year.